A series of events has been held across the UK to mark the first annual National Veterans' Day. A No 10 reception for representatives of veterans' associations was among the events taking place. Chancellor Gordon Brown hailed ex-servicemen and women as their "nation's pride" on Monday, ahead of the celebrations. Ministers said earlier this year the contributions of armed forces personnel would be remembered every 27 June. The day will be a permanent extension of Veterans' Awareness Week, which was held for the first time last year. Prime Minister Tony Blair, Defence Secretary Des Browne, veterans minister Tom Watson and Mr Brown met former servicemen and women from almost 40 groups. Launching the event, the defence secretary announced that there would be a national memorial service, held at Westminster Abbey in London, after the last World War I survivor dies. There are thought to be less than 10 Britons still alive who fought in the 1914-18 conflict. Mr Browne said: "We often think of veterans as the older generation who fought in the world wars, but we want to remind people that a veteran can be any age from 18 to 110." He said everyone owed them a "debt of gratitude" for their contribution to the country's freedom, democracy and prosperity. Mr Browne also told hundreds of war veterans at a Veterans' Day event, at the Imperial War Museum in London, that the deaths of two soldiers in Afghanistan was a "powerful reminder of the highest price" that many service personnel had paid over the years. The defence secretary also attended a lunch commemorating the anniversaries of both the Victoria Cross and the George Cross. After meeting the minister, around 30 recipients of the bravery medals lined up on the steps of the war museum for a group photograph. 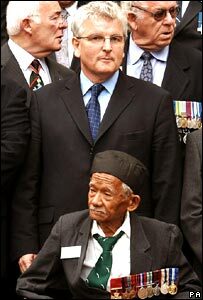 Among those present, were Captain Lachhiman Gurung (VC), a former rifleman in the 8th Ghurkha Rifles. He successfully picked up two grenades which were thrown into his trench in Burma in 1945. When he threw a third grenade which had landed beside his trench it exploded, blowing off his fingers and shattering his arm and causing serious wounding to his face, leg and body. The youngest George Cross recipient in the photograph line-up was Lance Corporal Christopher Finney. He was awarded the medal in October 2003 after climbing on to his burning vehicle to rescue his trapped gunner after a "friendly-fire" incident in Basra, southern Iraq. Chancellor Gordon Brown later visited London's Cabinet War Rooms where primary school children were having tea with veterans from conflicts including World War II and the Iraq war. Mr Brown said: "It's a great opportunity for the schoolchildren to hear about the history of this country." He added: "About the bravery and the courage but also about the events." Elsewhere, armed forces minister Adam Ingram attended a parade in Dundee. And former soldiers, air crews and sailors were presented with medals at ceremonies across the UK. Other events included a royal visit to the Royal Hospital in London, a service at Westminster Abbey, a parade in Staffordshire and the launch of archives in schools. The Veterans Agency said 27 June was chosen for National Veterans' Day as it came the day after the anniversary of the first investiture of the Victoria Cross, which happened in Hyde Park, London, in 1857. Last week, a £4m boost for a scheme encouraging youngsters to meet ex-service personnel was announced. Visits to historic sites, memorials and war graves around the world will also be financed, the Big Lottery Fund said. National Veterans' Day follows the US model, where former servicemen have had an official holiday since 1954. This dates back to when Armistice Day on 11 November was changed to Veterans' Day by an Act of Congress. Armistice Day marks the end of fighting between the Allied forces and Germany in World War I. Will you be taking part in Veterans' Day? Send us your comments and experiences. Any good pictures or video should be sent to yourpics@bbc.co.uk, or by mms by dialling +44 (0)7725 100100 and 3G: +44 (0)7888 100 100. Why on earth is this day passing by with barely a notice from the general public? Surely a day to celebrate people as important as our Veterans, should have some kind of national holiday, or at least some kind of celebrations? It wasn't until I read this article that I even knew it was Veterans Day today! It's about time the government gave these people the honour and respect they deserve! I've just read that it is Veterans' Day today and it's the first I've heard about it! I, like the majority I suspect, am proud of relatives of mine that have fought and died for their country but I'm puzzled why we have this day when everyone already recognises November the 11th as a unofficial Veterans' day. Like a lot of vets (mid 30's) I was chewed up in NI, Bosnia, Iraq etc and so was my brother but the 'debt of gratitude' obviously doesn't extend to those of us left in a mess, either physically or mentally. We're just sat here today reminiscing about those mates who aren't around to be ignored. Nice medal ceremonies and political soundbites don't help those who are still struggling or their families. Today is my birthday and I am so proud that it is now going to be Veterans' Day. Like so many other brave souls, my Grandfather was killed in Italy in the 2nd World War, leaving my Nan a widow at 31 with 3 small children. It is so important that we and future generations remember and mark the great sacrifice that was paid by so many and their families.